France in London | How much do you know about the real Jean Dujardin? How much do you know about the real Jean Dujardin? Now winner of a Golden Globe for his cinema performance in The Artist, Jean Dujardin is on the verge of global stardom. France In London puts the spotlight on Dujardin with 9 key questions. When did Dujardin discover he had a comic talent? Surprisingly, Jean Dujardin discovers his talent during his military service when he realises that he has the ability to make his friends laugh. Where does Dujardin begin his career? He starts his career performing in bars and small Parisians theatres. 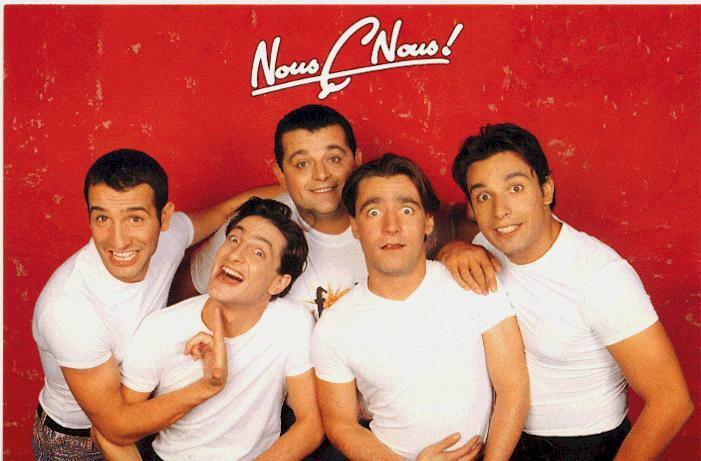 He gets involved in the group “Carré Blanc” and creates the group “Nous C Nous” with Eric Collado, Emmanuel Joucla, Eric Massot and Bruno Salomone. They create together various sketches such as Les désagréables : À la plage et À Noël or Le faux débat : Les allumettes. It is also with “Carré Blanc” that Jean Dujardin creates his character Brice de Nice. The group also appears on the TV shows of Patrick Sebastien on France 2. What was Dujardin greatest TV success? From 1999 to 2003, the duo Chouchou (Jean Dujardin) and Loulou (Alexandra Lamy) feature in the TV series of France 2 Un gars, une fille. The series, broadcast just before the 8pm news, focuses on the funny side of domestic disputes. The French public is quickly won over and approximately 500 episodes are produced. Who is Brice de Nice? Yellow tee-shirt, blond wig, a surfboard under his arm, Brice de Nice is already a legendary character in France. Brice de Nice is a character invented by Jean Dujardin when he was in the group « Nous C Nous ». Everything changes in 2005 James Huth produces the film Brice de Nice with Dujardin in the starring role. The phony surfer’s catchphrase, “cassééé”, with the obligatory accompanying gesture, becomes a phenomenon and is heard and seen in classrooms and playgrounds across France. A legend is born. In which famous films does Dujardin appear? He gets top billing, for the first time, in the comedy Mariages! in 2004 a film which sold more than 2 million cinema tickets. In 2007, he plays the role of French spy Hubert Bonisseur de la Bath in OSS117 : Le Caire Nid d’espion, alongside the actress Bérénice Bejot (her assistant). The film is a great success with more than 2.2millions tickets sold and a nomination for the Oscar for best actor. In 2009, the adventures of the secret agent return to the screen with the film OSS117 : Rio ne répond plus. This same year, Jean Dujardin is also in Lucky Luck with Michaël Youn and Sylvie Testud. But Dujardin does not just appear in comedies. He also plays the role of a policeman in Contre-enquête (2007), of a publicist in 99 francs (2007), of an alcoholic writer affected by a cancer in Le Bruit des Glaçons (2010) or, of a real estate agent in Un Balcon sur la Mer. He also appears briefly in the film Les Petits Mouchoirs (Little White Lies). His leading role in The Artist, has now launched him on a far bigger stage, making him one of the most well know French actors in the world. Which are the biggest awards he has received to date? Jean Dujardin has just been elected « man of the year 2011 » by the magazine GQ . For his role in The Artist, he wins the prize as best male actor in Cannes (2011) and a Golden Globe for best actor. On 20 January in London, at the London Film Critics' Circle Awards, The Artist also won 3 more prizes. Surely the next successful stop is the Oscars in February? Who is the love of Dujardin's life? Father of two young boys (Simon, 11 and Julien, 10) originally from a first marriage, Jean Dujardin now shares his life with the delightful Alexandra Lamy. Married in 2009, the glamorous couple seems to be going strong since their encounter in the TV series Un Gars, une fille. During the Golden Globes ceremony on 15 January 2012, Jean Dujardin thanks his « beautiful and talented wife ». What is the secret of Dujardin’s charm ? Jean Dujardin and the Americans , love affair or one night stand? The actor confides in the magazine GQ after his election as « Man of the Year 2011 »: « I don’t understand anything of what the Americans say! Of course, now, I begin to understand some questions by heart ; but when it is more complicated, I say «what? ». That does protect me and keeps me in my comfort zone. I don’t think I could have a career there ». Le Tribulateur dit :Continue comme ça mon cher H et je vote pour toi pour « l’homme le plus drôle du monde 2010&#8243;!